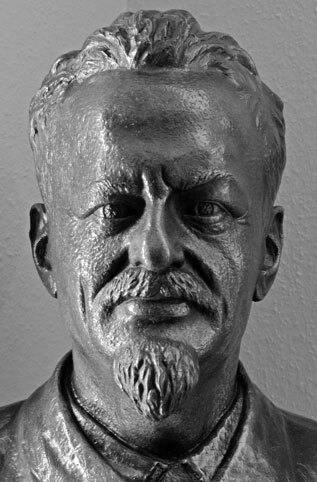 Note: This special bibliography has been discontinued in 2009; it will not be amended or updated; for further (and newer) material and for amendments we refer to the chapters 2.8.07.05 and 2.8.08 of our Lubitz' Leon Trotsky Bibliography (LLTB). This bibliography lists printed items (books, dissertations, contributions to journals, etc., chiefly in English, French, German, Spanish and Russian language), some films and video recordings as well as a modest portion of items published (only) electronically in the World Wide Web about Trotsky's last one and a half years of exile in Mexico and about the house in Coyoacán where he was murdered on August 20, 1940 and which later became part of the Trotsky Museum (Museo Casa de León Trotsky). The selection of titles also includes items about Trotsky's assassination and about his murderer, Ramón Mercader, as well as some items of fiction (e.g. plays) about Trotsky's life and death in exile. Aguilar Mora, Manuel: Siqueiros vs. Trotsky. - 15 pp. Aguilar Mora, Manuel: Trotsky y los "amigos de la URSS". - 15 pp. Alvahuante, Felipe: El asesinato de León Trotsky. - Bruselas : Ed. Krupskaya, [194?]. - 111 pp. El asesinato de Trotsky / dir. : Motfos Gueilburt. Prod. general: Julián Rousso [et al.] Narado por Julio Bracho. Coord. general: Manuel Tufró. Investigación: Guilermo Almeyra. Una co-prod. de Anima Films y The History Channel Latinoamérica. - [S.l. ], 2007. - 1 DVD, running time: 1 h, 38 min. DVD recording from TV programme, originally broadcast on Aug. 20, 2007. Documentary play emitted by The History Channel Latinamérica with commentaries by Olivia Gall, Esteban Volkov, Manuel Aguilar Mora, Javier Wiemer, Carlos Fernández et al. L'assassinat de Léon Trotsky. - Paris : Publications du Secrétariat de la IVe Internationale, . - 63 pp. L'assassinat de Trotsky / un film de Joseph Losey. Scénario: Nicholas Mosley [et al.] Avec Alain Delon, Richard Burton, Romy Schneider [et al.]. - Paris : René Chateau Vidéo, 1994. - 1 videocassette (VHS), running time: 1 h, 40 min. Video recording, originally produced in 1971 by Cinetel, CIAC, Dino de Laurenties, Cinematografia S.P.A.
Video recording, originally produced in 1971 by Cinetel, CIAC, Dino de Laurentiies, Cinematografia S.P.A.
Video recording of 2 episodes from the TV series "Spies", a presentation of Columbia House. Episode 1, "License to kill", is about Ramón Mercader and the assassination of Trotsky. Earlier videocassette release: Terre Haute, Ind. : Columbia House Co., 1992. The assassination of Trotsky / dir. : Joseph Losey. Screenplay: Nicholas Mosley. Participants: Alain Delon, Richard Burton, Romy Schneider [et al.]. - London : Channel 5, 1986. - 1 videocassette (VHS), running time: 1 h, 39 min. Video recording, originally released as motion picture in 1972 by Josef Shaftel Productions Ltd. The assassination of Trotsky / dir. : Joseph Losey. Screenplay: Nicholas Mosley. Participants: Alain Delon, Richard Burton, Romy Schneider [et al.]. - Los Angeles, Cal. : Republic Pictures Home Video, 1987. - 1 videocassette (VHS), running time: 1 h, 42 min. Pt. 2 with alternative title Ein "Planet ohne Visum"
Breve estancia : León Trotsky en México / Gerardo Romero-Salinas et al. Broué, Pierre: Trotsky a veinte años de octubre. - 12 pp. Campa Salázar, Valentín: El caso Trotsky / Valentín Campa S.
El "caso" Trotsky / M.H. Ceniceros, Eduardo: Jacques Mornard - gestiones para obtener su libertad preparatoria. - México, D.F. : Atenea, 1957. - 281 pp. Chemouni, Jacquy: Le psychanalyste Eitingon a-t-il participé à l'assassinat de Trotsky ou à des actions d'espionnage au profit du régime stalinien? Cobo, Juan: El asesino de Trotsky : verdugo o victima? Cordova, Carlos: De la vida y de la muerte : una approximación museológica a la casa de León Trotsky. - 16 pp. Dazy, René: La liquidation du "Vieux"
Debroise, Olivier: Historia de una carta. - 10 pp. DeCesare, Lodovico: La vita di Trotzky per quella di tua madre! Du nouveau sur l'assassinat de Trotsky / M.W. [Fiftieth anniversary of the assassination of Leon Trotsky] : remembered in a special broadcast recounting the event / participants: Andy Lanset et al. - London : BBC, 1990. - 1 sound tape reel, running time: 12 min. La fine di Trotzki / S.P. Frank, Joe: The death of Leon Trotsky. - Washington, DC : National Public Radio, 1979. - 1 sound cassette, running time: 59 min. Gall, Olivia: Cárdenas, Múgica y Trotsky. - 15 pp. Gall, Olivia: Trotsky et la vie politique dans le Mexique de Cárdenas : (1937-1940). - 1-2. - [XV], 668 pp. Rev. version of paper submitted to the 7a Jornadas de Historia de Occidente, Jiquílpan de Juárez, Nov. 1984. - Transl. from the Span. ms.
Garmabella, José Ramón: Operação Trotski. - Rio de Janeiro : Record, [s.d.]. - 192 pp. Garmabella, José Ramón: Operación Trotsky. - México, D.F. : Ed. Diana, 1972. - XII, 186 pp. Garmabella, José Ramón: Operación Trotsky. - 2. impr. - México, D.F. : Ed. Diana, 1973. - XII, 186 pp. Garmabella, José Ramón: Quién fue Jackson-Mornard? Goldman, Albert: The assassination of Leon Trotsky : the proofs of Stalin's guilt. - New York City : Pioneer Publ., 1940. - 74 pp. Goldman, Albert: Quién está detrás del asesino de León Trotsky : los hechos y los argumentos que prueban la culpabilidad de Stalin. - México, D.F. : Ed. Clave, [ca. 1940]. - 90 pp. Gorkin, Julián: El asesinato de Trotsky / [trad. de Ramón Margalef Llambrich]. - Barcelona : Aymá, 1971. - 280 pp. Gorkin, Julián: El asesinato de Trotsky / [trad. de Ramón Margalef Llambrich]. - [Barcelona] : Círculo de lectores, . - 218 pp. Gorkin, Julián: L'assassinat de Trotsky. - Paris : Julliard, 1970. - 318 pp. Reprint of the 1970 ed. Gorkin, Julián: Cómo asesinó Stalin a Trotsky. - Barcelona : Plaza & Janés, 1961. - 224 pp. Gribble, Leonard Reginald: Hands of terror : notable assassinations of the twentieth century. - London : Muller, 1960. - 228 pp. Guía del Museo León Trotsky = Museum guide. - [México, D.F.] : A. Tobares, [s.d.]. - 15 pp. Gutiérrez-Alvarez, Pepe: Trotsky en México. - 5 pp. Hunter, J.C.: The murder of Trotsky and the fight against Stalinism. - New York, NY : Leninist League U.S.A., 1940. - 11 pp. Ives, David: Változatok Trockij halálára / Szilágyi Mihály fordítása. - 5 pp. Justo, Liborio: León Trotsky y Wall Street : cómo el lider de la Cuarta Internacional se puso al servicio del imperialismo yanqui en México / Quebracho [i.e. Liborio Justo]. - Buenos Aires : Ed. Badajo, 1959. - 154 pp. Katel, Peter: La prensa estadounidense ante el huésped rojo de Cárdenas. - 20 pp. Paper originally submitted to the Coloquio Trotsky, Revelador Político del México Cárdenista, México, D.F., May 18-22, 1987. - Transl. from the Span. ms.
Lange, Hartmut: Trotzki in Coyoacan. - Frankfurt a.M. : Verl. der Autoren, . - 79 pp. Levine, Isaac Don: Han myrdede Trotsky / overs. fra amerikansk af Jørgen Rothenborg. - København : Wangel, 1962. - 245 pp. Levine, Isaac Don: La mente de un asesino. - México, D.F. : Visión, 1960. - 224 pp. Levine, Isaac Don: The mind of an assassin. - London : Weidenfeld and Nicolson, 1959. - XVII, 236 pp. Levine, Isaac Don: The mind of an assassin. - New York, NY : Farrar, Strauss, and Cudahy, 1959. - XVII, 236 pp. Levine, Isaac Don: The mind of an assassin. - Reprint. - Westport, Conn. : Greenwood Pr., 1979. - XVII, 236 pp. Reprint of the 1959 ed. Levine, Isaac Don: Mordet på Trotskij / övers. från engelskan: Céline-Marie och Walter Dickson. - Stockholm : Tiden, 1963. - 262 pp. Levine, Isaac Don: Die Psyche des Mörders / [ins Deutsche übertr. von Babette Gross]. - Wien [etc.] : Europa-Verl., 1970. - 254 pp. Libera, Zbigniew: Trotsky's ice-pick. - Paris : Onestar Pr., 2006. [Without pag.]. Medellín Ostos, Octávio: Proceso Mornard (caso Trotsky) : expresión de agravios de la defensa. - México, D.F., 1944. - 69 pp. Pres. before the Tribunal Superior de Justicia del Distrito Federal, México. - Designated as "primera parte"
Monsivais, Carlos: Revolución méxicana, territorio de refugio político intelectual, artistico. - 10 pp. Der Mord an Leo Trotzki : Hansen und Novack - Komplizen der GPU / Internationales Komitee der IV. Internationale. - Essen : Bund Sozialistischer Arbeiter, [ca. 1977]. -  pp. Mosley, Nicholas: O assassinato de Trotsky / trad. de Fani Baratz Moreira Costa. - Rio de Janeiro : Record, [s.d.]. - 186 pp. Mosley, Nicholas: The assassination of Trotsky. - London : Abacus, 1972. - 185 pp. Mosley, Nicholas: The assassination of Trotsky. - London : Joseph, 1972. - 185 pp. Museo Casa de León Trotsky. - México, D.F. : Instituto del Derecho de Asilo, Museo Casa de León Trotsky, A.C., [s.d.] - 34 pp. Museo Casa de León Trotsky : memoria de su restauración. - Ciudad de México : DDF [Departamento de Distrito Federal], 1990. -  pp. Patula, Jan: Trotsky in Mexico : new evidence on his assassination. -  pp. Pérez Montfort, Ricardo: Trotsky y las derechas mexicanas en 1937. - 17 pp. Puga Imaña, Mario A.: Elegía a la muerte de León Trotsky / M.A. Puga. - [Lima : Impr. Juan la Cotera, 1941]. - 25 pp. Quiróz Cuarón, Alfonso: El asesino de León Trotzky y su peligrosidad en vista de los datos de su identidad / Alphonso Quiroz C.
Ramón Mercader, crimen y castigo / montaje: J.J. Martin Salazar. Producción: Andres G. de la Calera. Realizador: Lisardo García Bueno. Guión: Juan Cuesta. - [S.l., s.d.]. - 1 videocassette (VHS), running time: 58 min. Video recording of a documentary film, originally broadcast by TVE 1 in 198? Containing chiefly Trotsky, León: Ma vida, 2. ed. Rodríguez Santoyo, Raúl: Cárdenas y el asesinato de Trotsky. - 3 pp. Romano, Rafael: Trotsky ultimado en Coyoacán : la conspiración insospechada. - Montevideo : Letraeñe Ed., 2009. - 255 pp. Sánchez Salazar, Leandro Apolinar: Ainsi fut assassiné Trotsky / Leandro A. Sánchez Salazar et Julián Gorkin. Trad. de l'espagnol par Jean Talbot. - Paris : Société d'Ed. Littéraire Française, 1948. - 258 pp. Sánchez Salazar, Leandro Apolinar: Así asesinaron a Trotski / Leandro A. Sánchez Salazar y Julián Gorkin. - Santiago de Chile : Ed. del Pacífico, 1950. - 252 pp. Sánchez Salazar, Leandro Apolinar: Así asesinaron a Trotski / Leandro A. Sánchez Salazar. - México, D.F. : Populibros "La Prensa", 1955. - 256 pp. Sánchez Salazar, Leandro Apolinar: De Gepeoe slaat toe! / Leandro A. Sánchez Salazar en Julián Gorkin. Vert. door Jef Last. - Amsterdam : Breughel, 1948. - 184 pp. Sánchez Salazar, Leandro Apolinar: Mord in Mexiko : die Ermordung Leo Trotzki's, ein Musterbeispiel des politischen Verbrechens / Leandro A. Sánchez Salazar in Zusammenarbeit mit Julián Gorkin. - Frankfurt a.M. : Verl. der Parma-Ed., 1952. - 334 pp. Sánchez Salazar, Leandro Apolinar: Mordet på Trotsky / Leandro A. Sánchez Salazar i samarb. med Julián Gorkin. - Oslo : Arbeidernes Aktietr., 1955. - 175 pp. Sánchez Salazar, Leandro Apolinar: Murder in Mexico : the assassination of Leon Trotsky / Leandro A. Sánchez Salazar ... with the collab. of Julián Gorkin. [Transl. by Phyllis Hawley]. - London : Secker & Warburg, 1950. - XIX, 235 pp. Reprint of the 1950 ed. Sicherheitsfragen und die Vierte Internationale : Antwort des Politischen Komitees der Workers Revolutionary Party auf den Artikel von Joseph Hansen "Das Geheimnis von Healys 'Dialektik'". - Essen : Bund Sozialistischer Arbeiter, 1975. - 63 pp. Storm the skies / prod. : José Luis López-Linares y Javier Rioyo. - [S.l.] : Cinematica, 2006. - 1 DVD, running time: 1 h, 36 min. Topf, Silvia: Die Ermordung Leo Trotzkis. - München : Bayerischer Rundfunk, 1990. - 17 pp. Documentary film consisting of 3 chapters: 1. El perseguido llega a México, 2. La revolución rusa y la revolución méxicana, 3. Del contraproceso al asesinato. - Containing interviews with and comments by P. Broué, O. Gall, A. Gilly, C. Payán, O. Fernández Vilchis, H. Blanco, G. Almeyra, A. Woods, E. Volkov, G. Novack, J. Wimer et al. - The film was presented at and awarded by the IV Encuentro Hispanoamericano de Video Documental Independiese, México, D.F., March 15-18, 2006. - Chiefly in Span. Trotsky's home movies / directed by Oliver Curtis. Movies taken by Alex Buchman . - [London] : Channel Four, BBC, 1990. - 1 videocassette (VHS-PAL), running time: 40 min. Trotzki-Mörder : neue Rätsel ; wollte Trotzkis Mörder Ramón Mercader die Hintergründe seines Verbrechens enthüllen? Vereeken, Georges: La Guépéou dans le mouvement trotskiste. - Paris : La Pensée Universelle, 1975. - 377 pp. Interview first publ. in La Stampa (Milano)>. 1990 (July 26). - Transl. from the Ital. Electronic resource, accessed Dec. 2, 2009, URL: http://zeitgeschichte.zdf.de/ZDFde/druckansicht/5/0,611,2038501,2038501,00.html Interview conducted by Zweites Deutsches Fernsehen (ZDF), March 19, 2003. Pt. 1 with title "Mord in Stalins Auftrag", pt. 2 with title "Der Mörder kam als Gast"
Weiss, Peter: Trotskij in esilio : dramma in 2 atti / trad. di Enrico Filippini. - Torino : Einaudi, 1970. - 140 pp. Weiss, Peter: Trotsky en el exilio : pieza en dos actos / versión española de Pablo Sorozabal Serrano [et al.]. - México, D.F. : Grijalbo, 1970. - 189 pp. Weiss, Peter: Trotsky en exil / trad. de l'allemand par Philippe Ivernel. - Paris : Ed. du Seuil, 1970. - 176 pp. Weiss, Peter: Trotsky in exile : a play / transl. by Geoffrey Skelton. - New York, NY : Atheneum, 1972. - 123 pp. Who killed Trotsky? / Ye.M. Soviet documentary about Trotsky and his assassination depicting some rare film and photographic material from Soviet archives. - Description based on a DVD video recording from a TV broadcast (unkown date). - In Russ.